Keeping your house free from bacteria and dirt can be a time consuming mission and the harsh chemicals that you would normally use can be expensive and dangerous to store when you have kids around the house. A solution to this from Danoz Direct is the Steam Dream Platinum. It’s a new member to the Steam Dream family with a great new look and a few additional, fantastic features. The Steam Dream Platinum has a handy stop/start button giving you complete control of the flow of steam. It’s perfect for when you need to clean every room of the house as you can just hit the stop button, and move onto you’re your next chore. The Steam Dream Platinum is a powerful cleaning tool that’s very user friendly, easy on the environment and will save you time and save you money. It comes with a whole range of accessories and attachments that really make light work of cleaning up around the home a breeze. Using the power of steam you can now blast away grease and grime with the touch of a button. 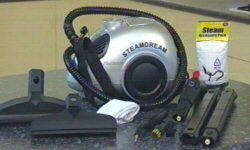 The Steam Dream Platinum is very versatile and portable so you can clean just about anything around the house with it. You can give the oven a good clean, remove nasty odours from lounges, curtains or rugs, and even clean the windows. It’s also great in the outdoors. It will bring the BBQ back to life and dust off the patio furniture and of course is great in the bathroom. This is where the Steam Dream Platinum really saves your elbow grease on the tiles and shower door hinges, it gets right into all those tight, hard to reach area’s. It really is the perfect, portable and extremely powerful all rounder cleaning tool for inside and outside the home and comes with Danoz Directs’ 30-day money back guarantee and 12month limited warranty.